Our company already has legal requirements to operate. From KPS permits for vehicle operational activities and Company Permits such as SIUP, TDP, PKP, NPWP, and Domicile in running the Company's legality. Sandholiday has a motto in running its transportation services, namely 'The most Trusted in your holidays'. The company is the right choice (service, comfort and safety) in a logistics partner using land transportation. 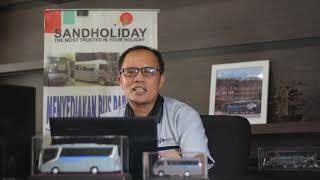 Sandholiday is present as one of the tourist bus rental agents who serve your vacation, both in the city of Jabodatebak, Bali and other tourist destinations in Java, Indonesia. Sandholiday comes to offer many advantages that are worthy of your consideration to be the main transportation of a tourist trip. All the best Sandholiday buses are provided with spacious space so you can always get safety and comfort during the trip.